There is an excellent bakery in my neighborhood where I go when I want to treat myself to something sweet. One dessert they offer is a Cardamom flavored Crumb Cake. The combination of a moist and dense cake topped with lots and lots of crumbs is delicious. So I decided I needed to make this cake at home. What cake to use was an easy choice, a Yogurt Cake, as it is wonderfully moist and dense which would go so nicely with buttery cardamom flavored crumbs. In North America, when we think of a Crumb Cake we normally think of using ground cinnamon as the flavoring. Cardamom, though, is another spice that is perfect in this cake. It's flavor and aroma is so wonderfully complex. It's sweet, yet warm and spicy, floral and lemony. It is sold either ground or in seeds (which you will need to grind). For those who would prefer the flavor of ground cinnamon, simply substitute an equal amount of ground cinnamon for the ground cardamom. 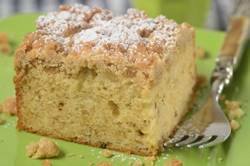 The Yogurt Cake has a dense and moist crumb which stands up nicely to the crumb topping. The cake is easy to make as you don't need a stand mixer. The ingredients are simply stirred together. For the yogurt, I normally use whole milk plain yogurt (Greek style) as I like its rich and tangy flavor. Crumb Cake: Preheat your oven to 350 degrees F (180 degrees C) and place the oven rack in the center of the oven. Butter, or spray with a non stick vegetable spray, an 8 inch (20 cm) square baking pan. Line the bottom of the pan with parchment paper. Cardamom Crumb Topping: In a bowl, whisk or stir together the flour, sugar, ground cardamom, and salt. Add the melted butter and stir until all the dry ingredients are moistened. Yogurt Cake: In a large bowl, stir or whisk together the flour, baking powder, baking soda, salt, ground cardamom, and espresso powder (if using). In another bowl, stir or whisk together the eggs, oil, yogurt, and vanilla extract. Stir in the sugar. Add the wet ingredients to the dry flour mixture. Stir until just combined. Scrape the batter into the prepared pan. Evenly scatter the crumb topping on top of the batter, pressing lightly so the crumbs adhere to the batter. Bake in preheated oven for about 40 - 45 minutes or until a toothpick inserted into the center of the cake comes out clean. Remove from oven and place on a wire rack to cool. You can serve this cake plain or with a dollop of whipped cream, ice cream, or lightly sweetened yogurt.